Members of the Delaware Hayes High School R.O.T.C. Honor Guard present the Colors on Sunday afternoon while Mary Bloch sings The National Anthem during the Pearl Harbor remembrance ceremony. The event was held on the Winter Street bridge in Delaware. 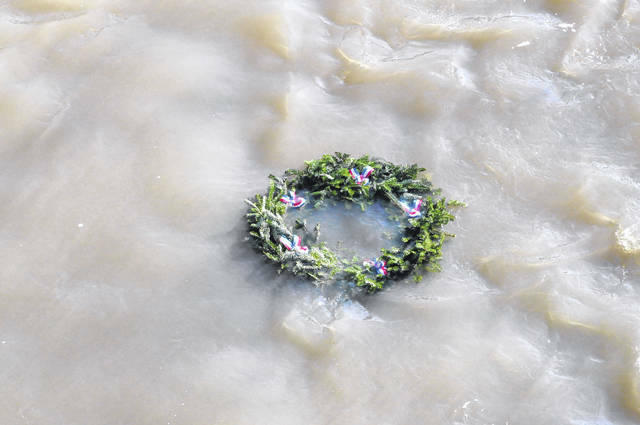 The Pearl Harbor Memorial Wreath floats down the Olentangy River on Sunday afternoon. 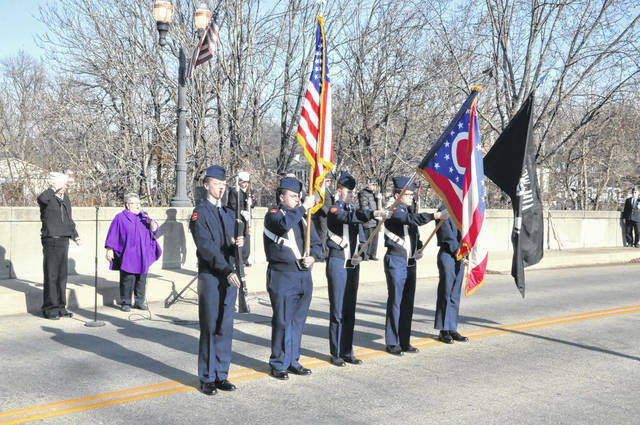 The Delaware County Veterans Association paid tribute to those who lost their lives in the Japanese attack on Pearl Harbor during an annual remembrance ceremony on Sunday morning. Local veterans dropped a memorial wreath into the Olentangy River from the Winter Street bridge in memory of their fallen brothers and sisters in arms. Cimino then read an excerpt from Roosevelt’s Dec. 8, 1941 speech to Congress and reflected on how things have changed for America since the Dec. 7 attack. “Today, we are of course 76 years from that time of attack,” Cimino said. “Almost all who survived the attack have been silenced by that thing we call death. Many have been cremated, their ashes interred in capsules and Navy divers have taken them back to place them aboard the (USS) Arizona and other ships at the bottom of Pearl Harbor. That they may forever be with their friends and fellow sailors who didn’t make it through that day. Cimino said he conducts the event every year because the “singularly most important” person in his life was his uncle, who was in the Navy during World War II and survived to serve as a father figure to Cimino. Cimino said he joined the Navy in 1963 and served three tours in Vietnam. “This is my way of saying thanks at large,” Cimino said. Harold Wells, an Air Force veteran who served during the Korean War, said he enjoys attending the annual event and said he was in school on Dec. 8 when Roosevelt’s speech was broadcast to students. “It’s nice to be able to honor all the lives that were lost,” Wells said. Galligher said he served on a submarine in the 1990s and was stationed at Pearl Harbor. He added that he lived in that area for years and said remnants of the attack on Pearl Harbor could still be seen, including bomb fragments at the housing complex where he lived. “Being an active reservist, it’s always nice to come out here and connect with veterans,” Galligher said. Galligher added that he was still in the Navy when the Fukushima Daiichi nuclear disaster occurred in March 2011 and said it was an experience that showed how much things have changed since Pearl Harbor. Galligher said the U.S. Navy provided disaster relief after the incident and said Japanese people would recognize him as an American and thank him for his help.